Wine tasting and Abel Tasman cruise and an educational, environmental bush walk. Enjoy a wine tasting, then cruise into the Abel Tasman. Take an educational bush walk and learn about some of New Zealand's native bush and its medicinal uses. An exclusive guided tour from the door of your accommodation by luxury Mercedes to Stephens Bay for your scenic cruise through the Abel Tasman National Park. After a lunch of fresh local delicacies in a secluded cove head ashore with your guide for a bush walk with stunning views and discover how the early pioneers and Maoris used different native plants and herbs for medicine and food. 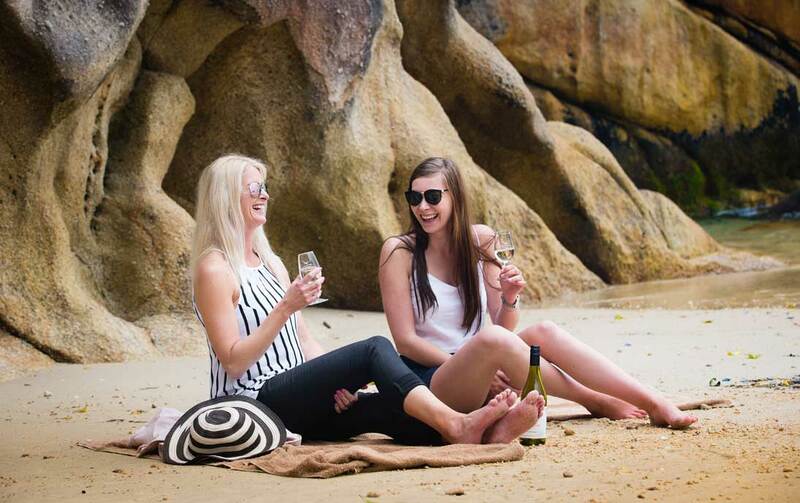 Returning to the beach it becomes real relaxation time to taste the very best of local wine varieties matched with the finest local produce that may include hot smoked salmon, mussels, venison and cheese. The hardest part is leaving this idyllic place to be returned to your accommodation. Departs: Recommended departure time 10.00am from Stephens Bay - returning at 4.00pm. Great Day in Abel Tasman- Highly Recommended! Fantastic experience exploring The Abel Tasman National Park with Abel Tasman Charters. From pick-up to drop-up everything went smoothly. The whole day was very organized, while still giving us the opportunity to explore the park on our own. Our skipper Emma was great and provided us with lots of information about the park, the beaches and the wildlife. We only had one day in the area and found that this tour was a great way to get the best out of the park. Also, you can't beat enjoying a lunch and local wine while taking in the Abel Tasman views on a boat! It was one of our favourite experiences on our recent NZ trip and is highly recommended. It truly is the best day out in the Abel Tasman park...the perfect host....perfect lunch...perfect tour. One of the best things is also that you start at Stephen's bay...so you escape the crowds of kaiteriteri.